Andyounnews.net is the PUP that uses misleading techniques to prevent removal. Use Reimage to locate malicious components and get rid of them faster than with uninstall instructions. A full system scan blocks virus reappearance and prevents traffic to malicious domains. When might the hijack occur? How to deal with Andyounnews.net virus? Andyounnews.net virus is a potentially unwanted program (PUP) that is capable of hijacking web browsers and alter their settings. This application might replace browser’s homepage and default search engine to its own domain. 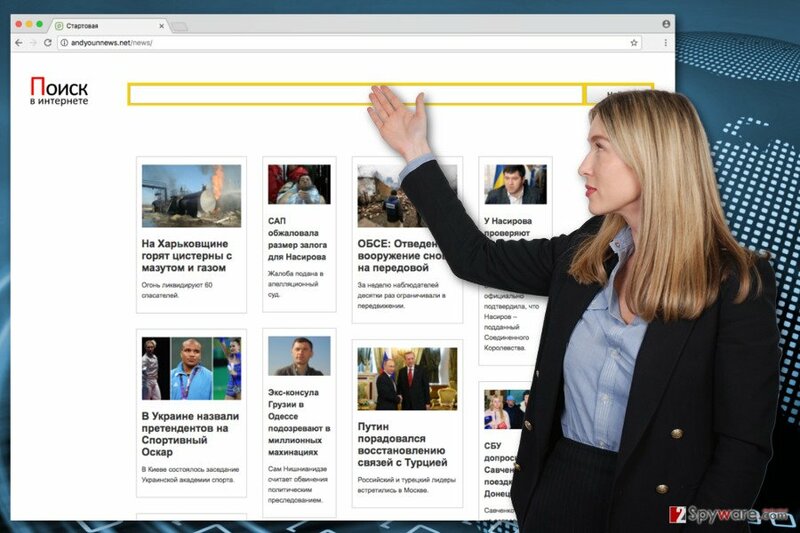 When people open affected browsers, they find this Russian news website, which also offers to look for the information using a search box at the top of the page. Though, using a website and search provided by the program that gets inside the computer without your permission is not a good idea. Andyounnews.net browser hijacker provides results from Google search. However, this situation might change any minute. These potentially unwanted programs are known for the ability to alter search results and replace organic links with sponsored ones. This activity allows generating revenue by driving traffic to websites that want to increase popularity or sales in a questionable way. Thus, if you do not want to be tricked into visiting an irrelevant or shady site, you should remove Andyounnews.net without hesitation. The easiest way to do it is to scan computer’s system with reliable anti-malware program such as Reimage. Browser hijackers are often capable of delivering advertisements and initiating redirects to the third-party websites. However, here might arise several Andyounnews.net redirect problems. First of all, the virus might be capable of tracking information about the users and delivering personalized ads. Thus, you might notice that some pop-ups or ads are similar to your latest search queries. The problem is that they might be infected or lead to the malicious website. Bear in mind that malvertising is one of the main ransomware distribution methods. Thus, having a potentially unwanted program on the computer raises the chances to encounter malware. Secondly, Andyounnews.net virus might initiate sudden redirects to the gaming, gambling, adult-themed or other suspicious websites. Indeed, in these sites, you might become a victim of phishing, tech support scam or other cyber crimes. Nevertheless, hijackers are not classified as harmful cyber infection; they can definitely cause indirect damage by letting you browse through insecure content. We highly recommend not to delay Andyounnews.net removal and avoid possible cyber threats. Andyounnews.net virus sets its domain as a targeted browser's homepage and default search engine. If you noticed this suspicious Russian website on your browser, you should choose one of the removal solutions. The first option suggests getting rid of the virus manually. At the end of the article, we have provided a manual Andyounnews.net removal guidelines. Have a look at them, and if they seem clear, follow them. Please, make sure that you eliminate all hijacker-related documents from the computer and all web browsers installed on your PC. Indeed, this task might be time-consuming and requires lots of effort. Though, there’s a simpler solution. You can remove Andyounnews.net automatically with a help of anti-malware programs. Our suggestions presented below. To remove Andyounnews.net virus from the system entirely, you need to locate and delete all hijacker-related components from the system. Please, follow the instructions carefully. If you miss some of the entries, you might experience another hijack. Here, look for Andyounnews.net or any other recently installed suspicious programs. Andyounnews.net virus rarely attacks Mac OS X. Though, if it happens to you, follow the instructions to remove the virus. Wait until you see Applications folder and look for Andyounnews.net or any other suspicious programs on it. Now right click on every of such entries and select Move to Trash. Follow the steps below to fix Internet Explorer after Andyounnews.net hijack. When in the new window, check Delete personal settings and select Reset again to complete Andyounnews.net removal. Follow the instructions below to reset Microsoft Edge after the hijack. Once these steps are finished, Andyounnews.net should be removed from your Microsoft Edge browser. If Andyounnews.net browser hijacker installed unknown third-party extensions or plugins, uninstall them immediately. The instructions below will help you to reset Mozilla’s settings. 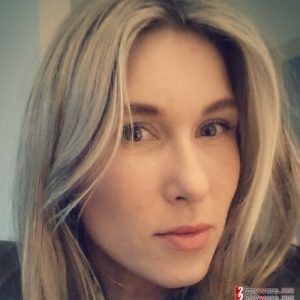 Here, select Andyounnews.net and other questionable plugins. Click Remove to delete these entries. Now you will see Reset Firefox to its default state message with Reset Firefox button. Click this button for several times and complete Andyounnews.net removal. Reset Google Chrome’s settings in order to finish Andyounnews.net removal. Then, you will be able to set preferred homepage and default search engine. Here, select Andyounnews.net and other malicious plugins and select trash icon to delete these entries. Click Reset to confirm this action and complete Andyounnews.net removal. The instructions below will help you to fix Safari after the hijack. Here, select Extensions and look for Andyounnews.net or other suspicious entries. Click on the Uninstall button to get rid each of them. Here, look at the Homepage field. If it was altered by Andyounnews.net, remove unwanted link and enter the one that you want to use for your searches. Remember to include the "http://" before typing in the address of the page. Now you will see a detailed dialog window filled with reset options. All of those options are usually checked, but you can specify which of them you want to reset. Click the Reset button to complete Andyounnews.net removal process. ^ 2017 Projections for the Growing Threat of Malvertising. The VAR Guy. VAR, MSP and Solutions Provider News. ^ Kim Zetter. 4 Ways to Protect Against the Very Real Threat of Ransomware. Wired. In-depth coverage of current and future trends in technology, and how they are shaping business, entertainment, communications, science, politics, and more. ^ Joel Lee. 5 Ways Visiting Adult Websites Is Bad for Your Security & Privacy. MakeUseOf. Technology, Simplified. ^ Types of Cyber Crimes. Cross Domain Solutions. Ensuring Complete Data Security. ^ Lincoln Spector. How to spot and avoid installing potentially unwanted programs. PcWorld. News, tips and reviews from the experts on PCs, Windows, and more. This entry was posted on 2017-03-10 at 06:02 and is filed under Stealing programs, Viruses. You can quickly scan the QR code with your mobile device and have Andyounnews.net virus manual removal instructions right in your pocket. How did you remove Andyounnews.net virus?